South African anti-apartheid activist Helen Suzman, who was one of the few white lawmakers to fight against the injustices of racist rule, died Thursday. She was 91. Suzman fought a long and lonely battle in the South African parliament against government repression of the country's black majority. She first visited Nelson Mandela, leader of the then-banned African National Congress, in prison in 1967 at the start of a long friendship. Nelson Mandela Foundation chief executive Achmat Dangor said Suzman was a "great patriot and a fearless fighter against apartheid." 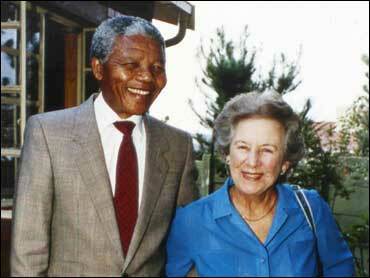 Suzman's daughter, Frances Jowell, said Suzman died peacefully at her Johannesburg home on New Year's Day. Jowell told the South African Press Association that there would be a private funeral this weekend and a public memorial service in February. For 13 years, Helen Suzman was the sole opposition lawmaker in South Africa's parliament, raising her voice time after time against the introduction of racist legislation by the National Party government. Born in the mining town of Germiston east of Johannesburg to parents who had fled anti-Semitism in Russia, Suzman's childhood was the charmed one of most whites - tennis, swimming lessons and private schooling. It was only when she got to university and studied the laws that were being put in place to govern black people that she says she was "roused to the discrimination." From then on she began to speak out against the conditions under which black people were forced to live, their lack of job opportunities and especially the dreaded pass system that restricted their movement. Her greatest achievement was helping to ensure that the pass laws were abolished. She was elected to parliament in 1953 for General Jan Smuts' United Party. A few years later she helped formed the liberal democratic Progressive Party, a later reincarnation of which is still the official opposition. A snap election in 1961 devastated the party, leaving Suzman on her own until 1974. She kept her seat until she retired in 1989. "I had a wonderful opportunity to use the parliamentary stage to bring the world's attention to what was going on," she said in an Associated Press interview on her 90th birthday.